The Auto Tweet Script is a small but practical php script. You are able to send your followers valuable content on autopilot. Through the message archive in the script admin panel, you will always have the full control over all sent Twitter messages and its status. This Auto Tweet Script comes with the new OAuth login process of Twitter. Script Features: - Create unlimited tweets to go out on autopilot (24/7) for you. - Add messages days, weeks, or even years in advance. 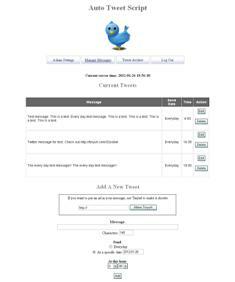 - Tweet archive for full control over all sent Twitter messages. - No Monthly Fees. - Integrated Tinyurl feature to easily make your URLs short for posting it within your tweets. - Supports special characters and not-latin characters. - Securely hand coded php code. - Easy and fast installation, setup and usage. - 1 year free updates. - Lifetime script license. This site does not contain serial number, crack, keygen Auto Tweet Script serial number : serial number is the simplest type of crack. A serial number(cdkey,product key,etc) is register the program as you may already know. a crack or keygen may contain harmful software. If you cannot find the exact version you want, just give it a try. for more information read .nfo/.txt/.diz file include in zipped file.